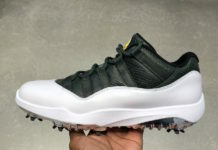 Jordan Brand will be expanding their Golf lineup with the debut of the Air Jordan 11 Low Golf releasing in the popular “Concord” colorway – which was debuted by Michael Jordan back in 2015. This Air Jordan 11 features a White leather upper with Black patent leather on the mudguard along with all other traditional details. Instead of going with a golf-inspired midsole, this model will keep its OG-styled midsole atop a two-tone translucent outsole. Look for the Air Jordan 11 Low Golf “Concord” to release on February 15th at select Jordan Brand retailers and Nike.com. The retail price tag is set at $200 USD. UPDATE: Nike releases official photos of the Air Jordan 11 Low Golf “Concord” that releases on February 15th for $200 USD.